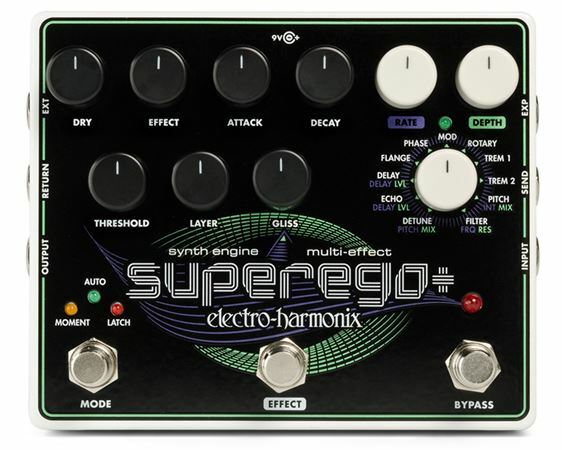 Order your Electro Harmonix Superego Plus Synth Engine Multi Effect Pedal from AMS and enjoy 0% Interest Payment Plans, Free Shipping, Free Extended Warranty & 45 Day Money Back Guarantee. Easily dial in your tone on the intuitive layout of the the Superego Plus which is packed with sound shaping power! The Superego+ creates synthesizer effects, sound layers, fluid glissandos, infinite sustain and lets you freeze notes or chords and play over them in four different freeze modes. Includes a complete effects section with EXP parameter control. I haven't played live with it yet but it's been amazing at home and the built in effects are good. I’ve only began to scratch the surface of what this pedal is capable of, it has tons of tonal possibilities. I bought it for creating ambient landscapes and layering, which it excels at. Looking forward to experimenting more with this pedal. Highly recommend!! Fantastic tool for tonal expansion! Amazing Pedal, so versitle, I can't stop using it. So worth getting. It does so much! I first bought this pedal thinking I would use it only for a song or two, just here and there for a little extra sprinkle of flavor on my guitar tracks. Oh was I so wrong. The SEUPEREGO+ is amazing, each effect on it sounds incredible, and with the expression pedal accessory this device has become not only my new favorite pedal but a staple on my pedalboard with no intentions of removing it anytime soon at all. I even thought at first I was just in love with it because it was new, a couple days later I went back to it and again I was wrong. I was still in love with it. The Rotary on it is heaven, the echo on it is so clean, the freeze works great too, everything on here is something I did not expect to find so much adoration for. This pedal can do so much for anyone's sound, not just guitar players. I was and still am very pleasantly surprised as I am still learning everything the SUPEREGO+ can do. I strongly recommend getting one.